Hashti, in most traditional houses in Iran, is the space one behind the sar-dar (doorway). Hashtis are designed in many different shapes, including octagonal, hexagonal, square and rectangular. The hashti is a space of distribution and circulation. Hasht, which means eight, is an allusion to an octagone with several directions which makes it possible to direct the person towards the various parts of the house, the andaruni or the birouni, towards the court or other dependences, according to the goal and the reasons of the visit. Initially, the hashti was intended to regulate the access and circulation towards the courses: private (andarouni), semi-public (birouni) reserved for the reception from abroad and the access to spaces of service. 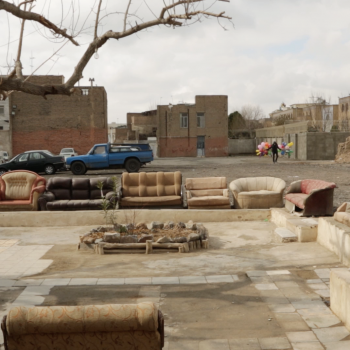 HASHTI is a film and discursive project intiated by Daniel Kötter, in collaboration with Shadnaz Azizi, Kaveh Rashidzadeh, Pouya Sepehr, Amir Tehrani. 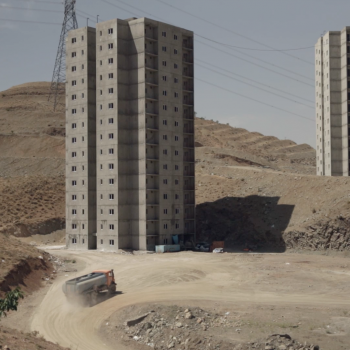 Based on the idea that Tehran itself represents a house, so to speak the inner circle of The Islamic Republic of Iran, the outskirts of the city become the space of transition between inside and outside, between urban and non-urban. 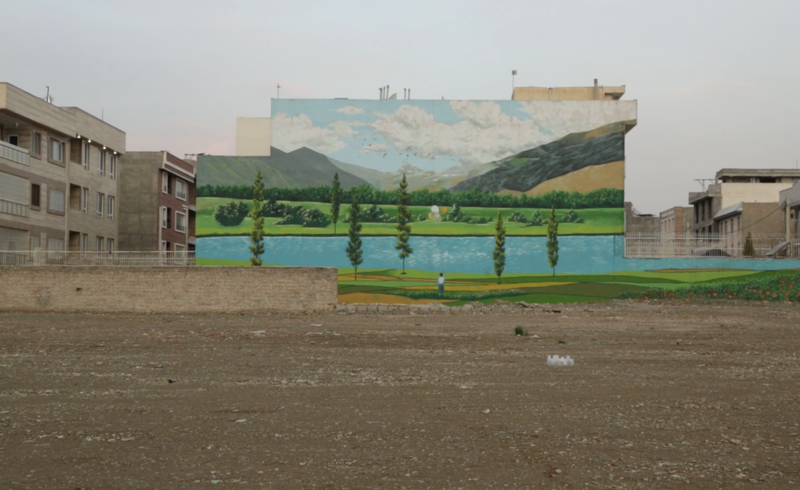 Thus the project looks at four very different areas in the outskirts of Tehran: the mountain of Tochal in the north, the area around the artificial lake Chitgar in the West, the construction of social housing called Pardis Town in the far east and the neighbourhood Nafar Abad at the southern edges of the city. 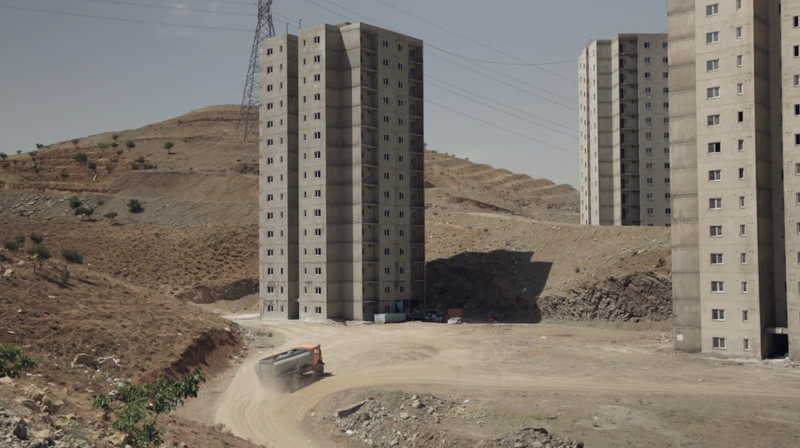 By combining Road movie and architectural documentary and by inverting the techniques of inside and outside shots the film HASHTI Tehran portrays Tehran through its peripheral spaces. „Segregation“ and „privatization“, „security“ and „control“ are core terms of urban transformation in the developping cities of the 21st century around the globe. Its contested counterparts are „public“ or „open space“, „access“ and „citizenship“. All these concepts seem stuck in the negotiation between aspiration of new liberal economies trying to connect to a global construction and business boom on the one and a tendency of preserving a shared public sphere for all groups of society within the urban area on the other hand. HASHTI tries to shift this focus to areas where the controlling force of urban development seems to lose its influence, where definitions get blurry and fluid: the edges and peripheries, those contact zones, where city and landscape, nature and construction meet. Can a citizen who leaves the city for recreational or other purposes, still be called a citizen? Which societal function does he take on, which political role does he play in the moment where he enters or lives in the periphery of a city? And speaking in terms of urban research: Which kind of alternative concepts of space are created in areas where urban planning and non-defined wastelands naturally intersect. Tehran’s peripheral geography shows a significant structural analogy with its social, environmental and psychological divisions: the northern periphery, reserved for the upper class in penthouse appartments and for recreation in the „clean air“ of the mountains, heavily contradicts the situation at the southern periphery, where smog and desert define the social life of the middle and low classes. While the geographical layout of the city with the mountains in the north and the desert in the south define a north-south axis, growth and development of the city are only possible on a west-east axis. HASHTI on one hand aims at examining the different strategies of urban planners, architects and sociologists in these areas. How is traffic, how are meeting places, contact zones, gardening controlled and defined? To what extend does wasteland and vegetation take over? And on the other hand: what are the different strategies of the actual inhabitants to live around these mechanisms of control and definition, how can alternative spaces be created, what role does the non-urban space play, the Zwischenstadt, in the every day life of those people. In the north of the city lie Alborz mountain, reaching up to 5600m with its highest peak Damavand. Alborz is not only used by tourists for hiking and skiing but also by Tehranis as an area for urban recreation. The northern city limits directly border the area of Tochal mountain, whose peak is connected with the urban area through a 12km long funicular. An mountain area used by urban people as part of their urban life. 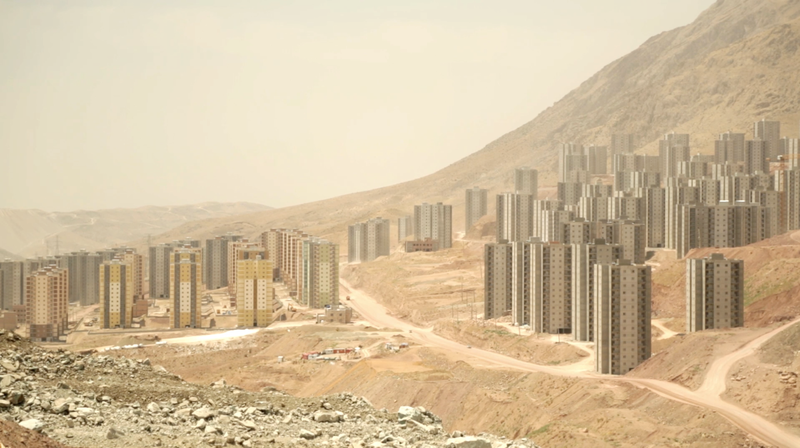 In the west of the city, north of Chitgar Park, the city limits currently extend again towards the foot of Alborz mountain with a complex of residential highrise buildings. 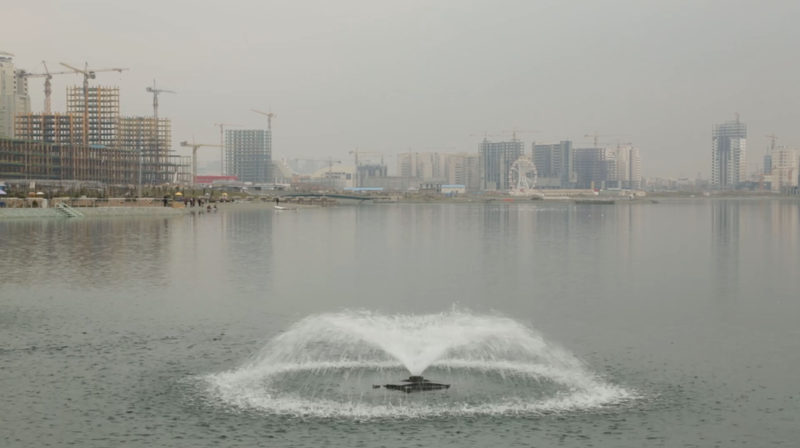 While the structures itself provide housing for middle class families, the spaces „in-between“ are renaturated for recreational purposes, including an artificial lake. A „second nature“ is conceived, built and offered. Concrete structures, open air pavements and boat cruises inaugurate a specifically cultural form of visibility, meeting and exchange, while „real nature“ is taking over: endemic birds started to settle and environmentalists, biologists and urban planners struggle with algae and mosquitos. How much „nature“ serves the purpose of a specific outer-urban residential middle class lifestyle? 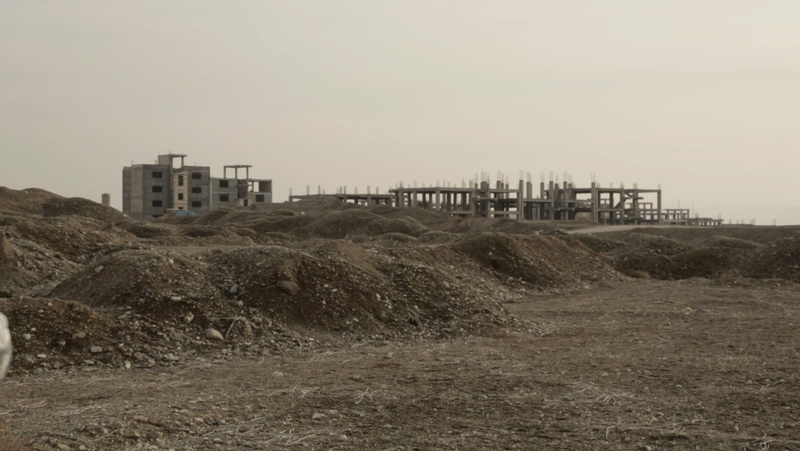 The social housing estate Pardis Town was built under the Ahmadinedschad administration 30 minutes by car east of Tehran. Cheap housing was constructed in 11 phases in the hilly and dry landscape. Neither shopping facilities nor schools or public transport were provided in the beginning. Here the question is turned upside down: How much „city“ is necessary to serve the basic daily needs of ten thousands of working class people starting a new life in an empty landscape? 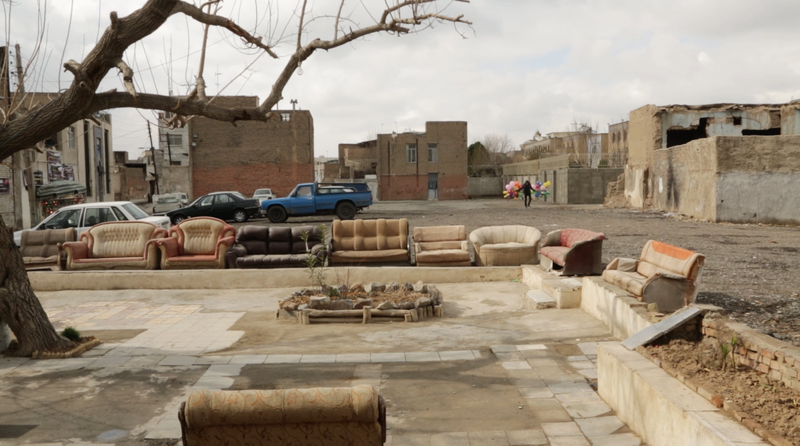 In Nafar Abad the relation between residential space and open space is designed differently: the population temporarily inhabits the space in between the small scale residential buildings by setting up furniture, armchairs and chairs for local meetings. In the south of the city, in districts like Shah-er-rey the city boundaries reach towards the desert and the landscape gives a first insight of what will await those who will leave the city southbound: The gigantic and vast salt lake Namak, which contrary to Lake Chitgar is a natural lake but does not provide water or opportunities for leisure activities. Furthermore, the neighbourhood is the location for the industrial treatment of waste water from the entire city: The Tehran Wastewater Treatment Plant is situated in the vicinity.